It always seems that winter is a dark, quiet, and less colorful time of year. Recently in Auburn, New York, the temperature dropped low enough that the snow falling created a dusting in sidewalk cracks and rooftops, a delicate preview of more to come. As the days get shorter and winter approaches, add some brightness into your life and visit Auburn&apos;s Quilts = Art= Quilts exhibit at the Schweinfurth Art Center. Quilting fun fact: Did you know that 1 in 20 Americans quilts? In a study published this year by Quilts, Inc. and F + W, A Content + eCommerce Company, data shows that there are more than 16 million quilters in America. That’s a lot of people quilting! Quilts might be a surprising choice as an antidote to the winter blues, but the art quilts featured in Quilts = Art = Quilts, are anything but boring. This year’s top prize-winning Best in Show quilt Chaos: The Butterfly Effect, by Kit Vincent, features bold slashes of color in each piece of raw-edged fabric sewn linearly to the quilt. The colorful effect creates a stimulating experience that draws the eye into the depth of the work. This year&apos;s exhibit features abstract, representational and whole cloth quilts made with an astonishing array of materials from including fabric, paint, paper, beads and more– these are not your great-grandmother’s quilts. This year there were over 350 submissions to QAQ from famous quilt-makers and artists around the country, and a number from around the world, from which 77 were selected to be in the exhibit. At the opening night, artists and visitors came from out of state to see the show. Each year this annual exhibit attracts visitors from across the nation and from other countries as well, due to the caliber and prominence of the artists featured. QAQ began in 1981 to recognize quilting as an art form on par with other fine arts and demonstrates how, like other art forms, quilting continues to evolve with new techniques and styles. Quilting fun fact: As of this year the U.S. quilting market is worth over 3 billion dollars! The value is up 5% from 2010. That&apos;s a lot of quilting activity going on. Auburn&apos;s Schweinfurth Art Center does it&apos;s part to promote and encourage quilting with this annual juried exhibit as well as it&apos;s nationallyrecognized workshops. First-prize winner Judith Martin visited us from her native Canada opening weekend to discover that her quilt Canadian Pioneer had won the first place prize, second behind fellow Canadian Kit Vincent’s. Martin’s quilt might not look like a quilt at first glance, but all entries into QAQ are quilts: the submission requirements state that a quilt is two pieces of fabric held together with stitching - the rest is up to the artist, and the artists in QAQ take their skills into very diverse directions. Some highlights of the variety of art quilts of QAQ include the graphic Seven Spirits by Kate Stiassni which focuses on color contrasting and geometric patterns. 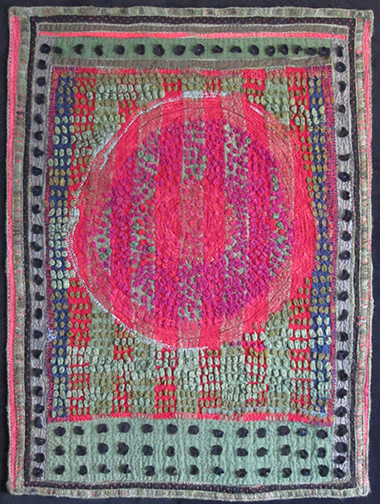 Other quilts, such as Moments by ­­­­­­­­­­­­­­­­­­­­­­­­­­­­­­­­­­Peggy Brown, are composed of a mesmerizing soft palette of silver leaf, watercolor painting, and blocks of what looks like aged paper, although it is really digital printing. And then there’s quilts such as Behold the Future by Kathleen Kastles, which depicts a girl and her mother and tells a little of their story. QAQ highlights the impressive variety of the art of quilt making, establishing it as a veritable artistic avocation. Quilting fun fact: 10.3% of U.S. households are home to at least one active quilter. So chances are you know someone that quilts! Quilters and non-quilters alike can enjoy QAQ. There is guaranteed to be an art quilt in QAQ that appeals to anyone, given the sheer range of approaches to quilting demonstrated by all the pieces in the exhibit. For more quilts, be sure to go next-door to the The Cayuga Museum of History and Art which is currently featuring Contemporary Heirlooms, an exhibit featuring traditional quilts made by members of the Cayuga Lake Quilt Guild. It is intriguing to see the differences and similarities between the art quilts of Quilts = Art = Quilts and the traditional quilts of Contemporary Heirlooms. One major commonality between the two is the community that exists in the quilting world: quilters are very enthusiastic about sharing techniques, participating in guilds, taking classes, and supporting each other in their quilting regardless of the many different styles and approaches. So if you are looking to come in out of the cold, Auburn&apos;s quilt exhibits are sure to brighten your holidays. Also in December the museums will be open for free on Sunday, December 14th from 12 to 5pm as part of Holiday Traditions. Quilts=Art=Quilts is on display through Jan.4, 2015. The Schweinfurth Art Center is open Tuesday through Saturday 10am to 5pm and Sundays from noon until 5pm. Admission is $6 for adults. Members and children under 12 are free. For more information, including quilting classes and other programs, visit www.myartcenter.org or call (315) 253-1553. Contemporary Heirlooms at the Cayuga Museum is open Tuesday through Sunday from noon until 5pm through Dec. 30, 1014.